Dayle Bayliss Associates has been shortlisted for a prestigious industry award. Dayle Bayliss, who runs Dayle Bayliss Associates, will discover if the project has won the Community Benefit or the Regeneration category of the Royal Institute of Chartered Surveyors East of England awards 2015 in May. Their entry dazzled judges as an example of community spirit, sustainability, regeneration and collaboration. It focused on a project to build a home for a GoMenta, a scheme designed to improve the skills and aspirations of the residents of Stowmarket. 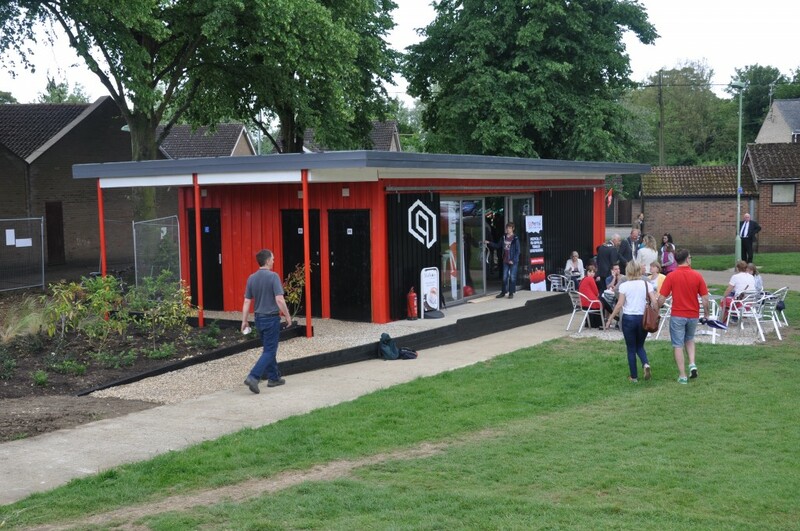 Called @TheRec, it involved the build of a café and training space in two upcycled shipping containers within a recreational ground, providing business support to fledgling enterprises and entrepreneurs. With a minuscule budget, Dayle Bayliss Associates worked alongside Menta and Stowmarket Town Council. She said: “The project presented the opportunity to act as a catalyst to engage the community in the local skills agenda. “It was an exciting vision and one we were only too happy to get stuck into. Dayle Bayliss offered her services free of charge. Her team worked to convert two 40ft shipping containers donated by Felixstowe Port to form the foundation of the building, both of which had to be insulated to comply with current building regulations standards. Dayle helped the project achieve planning and building regulation consent and was on hand throughout the build. She said: “The collaboration between different sectors on this project delivered real results. Planning was achieved in early 2014 and in June 2014 @TheRec opened its doors to the public. The café is now run by Community Interest Company Realise Futures so that any profits made are reinvested back into the local community. Job Centre Plus is working in partnership with the project to offer job clubs within the training space and the partnerships continue to develop. Menta manage the whole space and have a dedicated Youth Project Manager to ensure that consultation and engagement is ongoing, and that the space is always the communities. Dayle added: “The prospects for the building look very good indeed. “The income generated from the café support the day to day running and with courses being provided by the public and private sector there continues to be a hive of activity around the building. “What @TheRec shows is that when you work together, incredible things can be achieved.